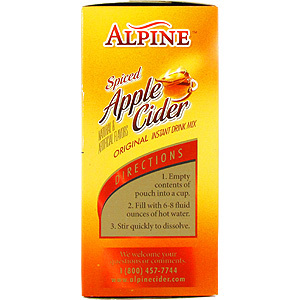 Alpine's Original Spiced Apple Cider instant drink mix contains only 80 calories, rich in vitamin C and contains natural and artificial flavors. Drink Mix: Empty contents of pouch into a cup. 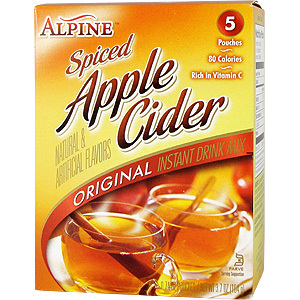 Fill with 6-8 fluid ounces of hot water. Stir quickly to dissolve. 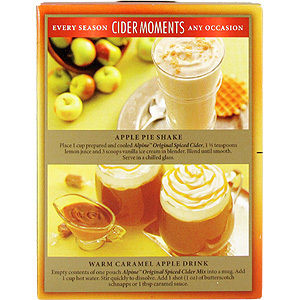 Apple Pie Shake: Place 1 cup prepared and cooled Alpine Orginial Spiced Cider, 1 1/2 teaspoons lemon juice and 3 scoops vanilla ice cream in blender. Blend unti smooth. Serve in a chilled glass. 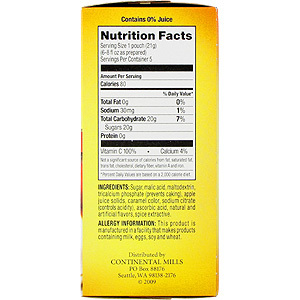 Sugar, malic acid, maltodextrin, tricalcium phosphate (prevent caking), apple juice solids, caramel color, sodium citrate (controls acidity), ascorbic acid, natural and artificial flavors, spice extractive. Spiced Apple Cider - Instant Drink Mix, 5 pouches is shipped in a discrete, unmarked package. Orders are processed immediately and usually takes about 3 to 5 working days to be received. We do ask that you try it for 2 to 3 weeks to feel the full effects. Any information received is used only for order processing and shipping purposes. Your information, such as e-mail address, will never be disclosed to a third party.